A batter's eye with a unique design, the Beacon Instant Eye offers a visual backdrop for hitters and allows wind to travel through without damage. The unique design reduces initial costs normally associated with traditional batter's eye. It is designed to allow wind to flow through the screen. The Instant Eye can be lowered easily to reduce wear in off-season or to allow for alternative activities in your park. Available in a variety of widths and heights. 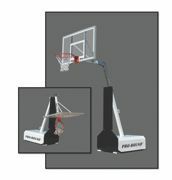 The Pro-Fold II features a 54-by-33-inch reinforced acrylic backboard, 6-foot-6-inch to 10-foot rim height adjustment with spring assist, 49 ˝-inch backboard extension, and standard commercial rim. Choice of colored post padding is available in red, navy, royal blue, forest green, Kelly green, orange, black, maroon and yellow. Features enclosed ballast compartment and two sets of dual wheels under ballast compartment with "Big Foot" brake pad system. "Sure Lock" post clamp reduces backboard shake compared to other goals in same class. In today's congested sports complexes with multi-use fields in close proximity to each other, keeping balls within the confines of the field is important. It's not only critical to ensure the safety of athletes, coaches and spectators, but also streets and parking areas. FieldPro Netting™ in-ground and portable systems by Jaypro Sports offers ultimate design flexibility to suit all backstop, perimeter and safety needs. Defender™ Barrier Nets are the latest in stacked netting solutions from InCord. The versatile net panels provide safety barriers for use in active play areas to keep the action contained and guests safe. Defender nets may also be used for field fencing, fall protection and for no-climb perimeter barriers. Net panels can be installed vertically or horizontally to protect walls, ceilings and generally anywhere that requires a barrier with impact-absorbing qualities. Gopher Sports best Keeper Aluminum Goals are constructed of powder-coated 2-inch diameter tubing with stabilizing rubber feet for indoor or outdoor play. Hook attachments allow for simple and fast net setup and takedown. Includes a tough extra-thick 5-millimeter net with 5-inch square UV-protected mesh for prolonged outdoor use. Easy assembly. Non-folding models have backstay bar for increased stability. Folding models have no-pinch swivel fold design for safe and easy mobility and storage. Available in three sizes. 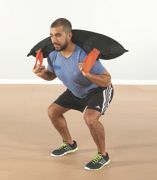 The Wreck Bag is an amazing tool that is tough enough to withstand your hardest workouts. Made from rugged polyethylene outer shell, these weight bags are breathable and will not absorb water, making them perfect for obstacle races or boot camp classes. Each one is filled with a shock-absorbing material that does not shift during use and is able to be carried, tossed, squatted, pressed or slammed. These Wreck Bags have sturdy handles made of soft webbing and are available in 25-, 35-, 40- and 50-pound sizes. DGA provides the highest quality disc golf equipment for your outdoor park and rec department. As the founding company of disc golf with more than 30 years of experience growing the sport, DGA offers the player-preferred targets and great personal service tailored to your park needs. DGA offers you the information you need to install a disc golf course, and can connect your with a course designer if you need help with your design.